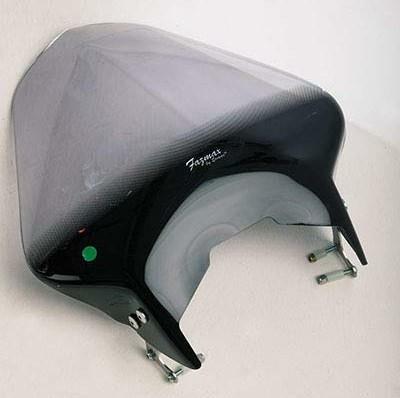 Flyscreen, headlight cowl, bikini fairing and handlebar fairing are different names for the same thing: a small fairing which deflects windblast, hopefully up and over the rider’s head. Why should I fit one? How about adding a little style, or individuality? Maybe you bought a naked bike because it was cheap(er) and now the excitement of owning it has worn thin with every aching neck muscle thanks to the windblast. In the way they work, yes. 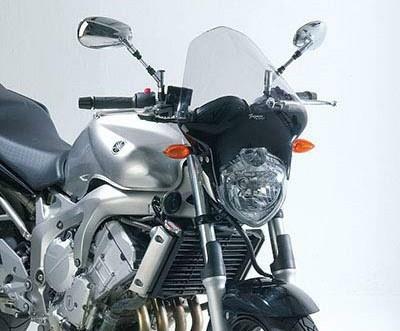 Style and how they attach to the bike can be completely different. Some are direct replacements for original screens but taller, wider and more fancy looking, especially if they have replacement headlights. Others bolt directly to the fork legs or headstock with ugly brackets and clamps. Pozidrive and flat-bladed screwdrivers, Allen keys and 1/8in drive sockets with matching ratchet spanner to allow removal of fasteners. Some cloth to protect the bike’s bodywork, copper grease to prevent fasteners from seizing and a rat tail file if you need to make the mounting holes bigger. They should all fit without any great problems. Most are custom made to suit specific models and are a cinch to fit. A universal fitting unit will need a bit more patience to figure out. Adding weight to any part of the steering system from the headstock forwards makes the steering heavier. Not drastically so, but it will be noticeable at speed. The handling may be affected because of disturbing the aerodynamics, or the fork springs and damping can’t deal with the weight. 1. Check that all of the parts needed, such as brackets, spacers and fasteners are included as per the instructions and parts list. And while you’re at it check the box to make sure it’s labelled as the right product for your bike. 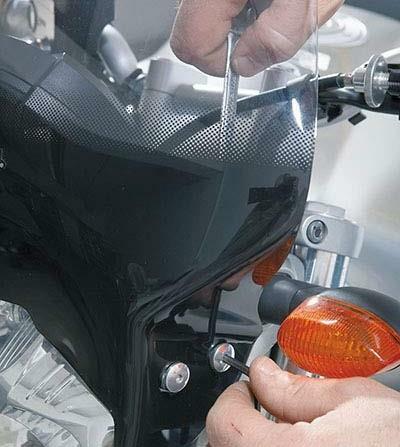 When ordering over the phone or internet, always quote the bike’s year of manufacture or model designation code. 2. 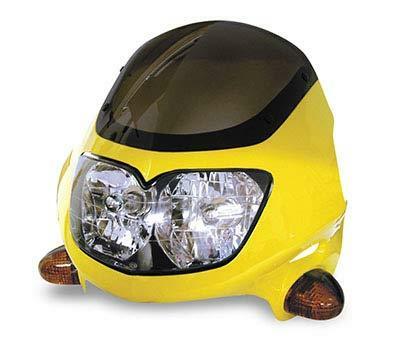 The golden rule is that the bigger or heavier they are (the one pictured above is one of the larger items and has built-in headlights), the more noticeable they’ll be when riding. 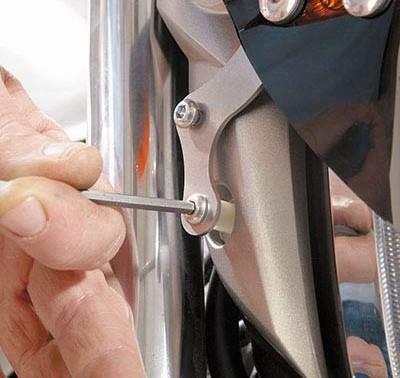 Any which bolt directly to the forks or headlight will move when the bars turn. 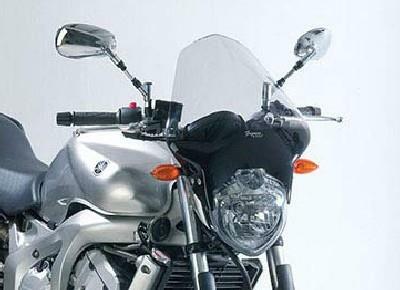 This can make steering heavier, or cause the bike to weave from disturbing the air flow. 3. 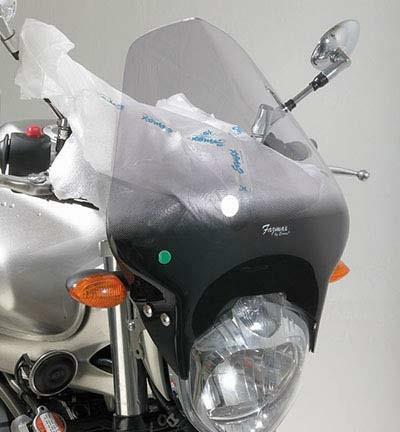 Before undoing any fasteners on the bike, or adding them to the flyscreen, offer the fairing up roughly into position. 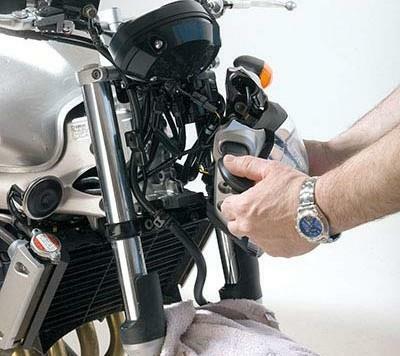 This way you get a feel as to what has to be done to fit it, such as moving cables or indicators and seeing what might rub or foul the screen. A good, long look will also tell you what extra tools you might need to the usual collection. 4. Always prevent the possible. 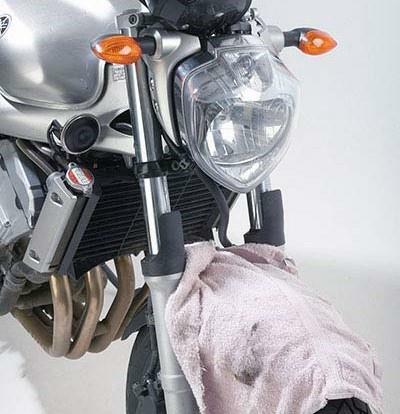 Here we have covered the front mudguard with an old towel just in case tools, fasteners or even the headlight accidentally drop on to it (check with your wife before raiding the airing cupboard though). Also use a container to keep safe any removed fasteners – washed clean curry containers are incredibly useful. 5. This flyscreen bolts on to the original headlamp mounting brackets and has longer bolts supplied with it. Sometimes the original bolts are used again so it’s important to note if different lengths or types of fasteners are used. 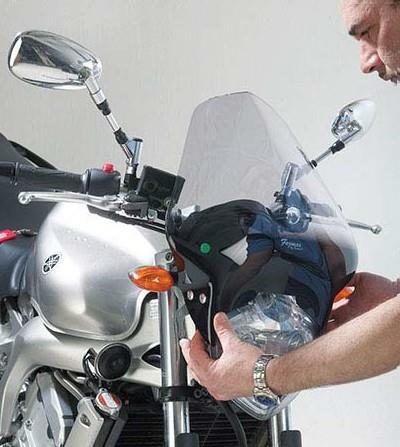 Also take note of the wiring (connectors, colours) if replacement headlamps are included. 6. 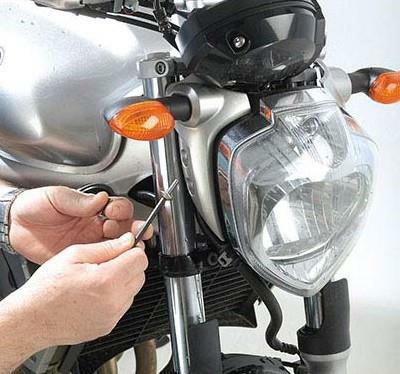 If the headlamp mounting bolts have to be removed (as shown), or the headlamp lens has to be removed, always be prepared for them to fall out. The wiring should prevent either item falling out completely and on to the floor, but then you don’t want bust wires. Gently tease the unit out and let it hang, or you could tape it tight against the fork leg. 7. Place on the bike ready to start fitting all the mounting screws/bolts, place some protective material (cloth, plastic sheet, etc) over the area the flyscreen will cover. 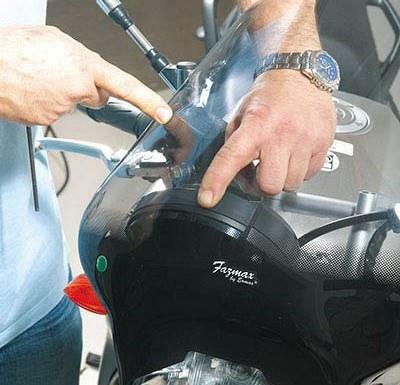 This way you’re preventing the screen part of the flyscreen from getting scratched against the clocks, top yoke, fork top, etc. 8. 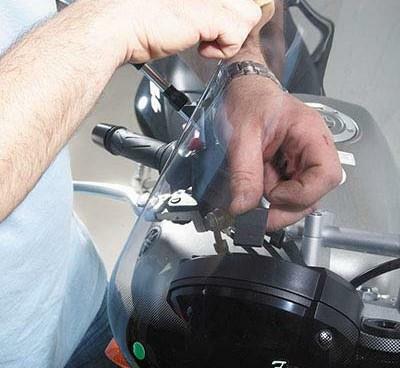 Don’t tighten any mounting nuts or bolts all the way up – leave them just short of finger tight to allow for small but necessary movement of the flyscreen in case some of the mounting holes don’t instantly line up. It also allows movement in the brackets so if spacers have to be used it’s not such an excruciating, painful, sweary experience. 9. If the bolt holes don’t align then make them longer (not wider or the bolt head will pull through) with a rat tail file. Nip the fasteners up a little tighter and check for clearance or anything fouling. Check for full turning lock and that the headlight, horn, indicators and dash warning lights all work. Also check the flyscreen is not rubbing on anything. 10. If the bolt holes don’t align then make them longer (not wider or the bolt head will pull through) with a rat tail file. Nip the fasteners up a little tighter and check for clearance or anything fouling. Check for full turning lock and that the headlight, horn, indicators and dash warning lights all work. Also check the flyscreen is not rubbing on anything. 12. The chances are (more so if the headlamp was removed) that the headlight’s beam alignment has been disturbed. To avoid this, before starting the job park the bike at a set distance in front of a wall. Turn the lights on and mark on the wall a noticeable part of the headlamp beam. When finished compare the beams and adjust if necessary.